Two recent developments in Michigan have caught the attention of local and sustainable food activists across the country. On December 14, 2014, Michigan’s governor, Rick Snyder, abolished the Michigan Food Policy Council (MFPC), absorbing the work of the Council into a new subcommittee within the Michigan Department of Agricultural and Rural Development. The same week, the Center for Regional Food Systems (CRFS) at Michigan State University issued a Request for Proposals to coordinate a new network of local food councils across the state. Although it is not clear if these two events are directly related, they both represent a transition in the local food movement in the state of Michigan. The Michigan Food Policy Council was created in 2005 by then Governor Jennifer Granholm with the task of bringing together stakeholders across the state interested in improving the food environment in Michigan. The council worked with a variety of urban and rural community groups, providing direct support to farmers as well as supporting initiatives to increase access to fresh, local food, especially in underserved communities. The Council’s work included collaboration with local food councils, including a fledging effort to pool these local councils into a statewide network. Now the CRFS is continuing this initiative. In 2014, CRFS conducted surveys and held meetings with representatives from local councils across the state. 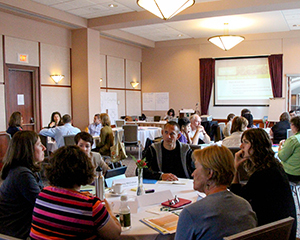 Through the RFP, CRFS hopes to identify an individual or group to launch an effective network that will bring together diverse local food councils across Michigan. However, Gensler isn’t as pessimistic. She notes that over the past ten years, Michigan has seen enormous growth in the infrastructure necessary to support local agriculture. With this in mind, she says the dissolution could be an opportunity to work across agencies and share information more broadly. Gensler adds that CRFS is viewing this as a transition and that the change has benefits. She echoes the sentiments of other former members of the MFPC, describing the new structure as a shift towards a more action-oriented food policy. Time is Running Out to Register for Local Orbit’s Hub Camp San Diego!